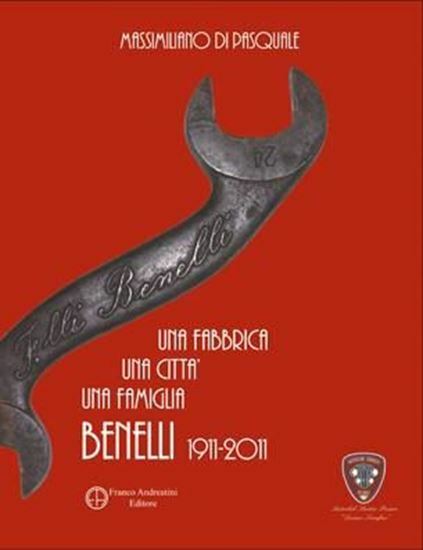 Book about the centenary of the Benelli Firm. When I met Dr Massimiliano Di Pasquale, the idea of publishing his thesis, with changes where needed, came to me. It was on Economic History, disserted at Bocconi University - Milan - in the year 1999: “A Factory, a Town, a Family “The Benellis”. The thesis, dealing with the socio - economic events of the motorcycle firm, analyses all the aspects – from the opening – up in 1911 to the international evolution, until it became an excellent trade-mark. In the book there are the changes of ownership which started in 1971 and went on with well – known managers: in succession, Alejandro De Tommaso, Giancarlo Selci, Andrea Merloni, the Chinese Group Q. J. the present owner. The book is enriched with photos of various motorcycle models and documents never published so far and they help understand the development of the Pesarese firm – in addition, there are testimonials of technicians and workers who worked in the firm for decades. More material is provided: personal photographic archives of members of the Benellis never published before, pictures from private albums of people who worked in the firm, the archives of “The National Museum of the Motorbike” in Rimini and “The Museum of the Motorbike” of Giancarlo Morbidelli, a very well – known collector of the Pesarese trade-mark. It’s a very serious historical research in 4 chapters – along with a cronological photographic review covering the one-hundred years of the Pesarese firm. A family saga which went through moments of glory but in time came to an inexorable decline.